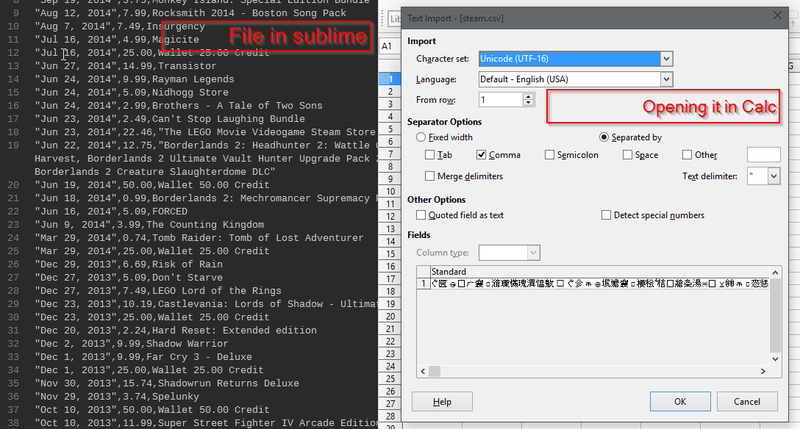 This makes LibreOffice interpret the file incorrectly as Chinese characters. This is fixable by changing the encoding, but it's pretty confusing if you don't know what encodings are, and I'm not sure why UTF-16 should ever be a default for a text-based file format. So, I haven't had coffee yet. Of course it fails in UTF-16, but the problem is that after upgrading 4.3 to 4.4, the default encoding changed to UTF-16, which "broke" CSV importing. I've heard about this (on Reddit I guess), yet for me your .csv suggests UTF-8 and not UTF-16. then LO offers WIN-1250 as default. WIN-1250 is default for Locale: cs_CZ. Your file is in UTF-8. => on Windows Cals fails to recognize encoding of .csv file and offers default encoding from windows enviroment.